Tree trimming is one of the most important tree maintenance practices in Denver, Colorado. When done correctly, tree trimming (also known as tree pruning) improves the health, appearance and safety of your trees. By diminishing the pressure that insects put on trees, trimming also reduces the need for pesticide use. Donovan Arborists believes when we are finished trimming a tree, it should still look like a tree. With Denver’s dry climate, hot summers and cold winters it is extremely important not to remove too much foliage. A lot of clients are under the impression that the more we prune off a tree, the more they are getting for their money - this is not always the case. Our ISA Certified Arborists are trained to meet your needs while improving the health, safety and appearance of your trees. Over a tree's lifespan, its trimming needs will change. To produce a structurally sound and healthy tree in its later years, begin pruning it as a sapling. Trimming young trees will also eliminate the need to install support cables when it reaches maturity. 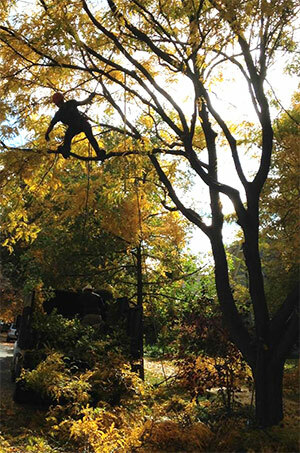 Donovan Arborists are specially trained to prune small to medium sized trees to yield stronger ones capable of withstanding Denver’s high winds and early fall/late spring snowfalls. Mature trees benefit from pruning as well. Proper trimming increases their health, appearance and level of safety. Dead and diseased limbs are removed. Crossing and interfering limbs are removed to increase air flow and light penetration. Branch tips are thinned and lightened to prevent storm damage. Donovan Arborists develops tree trimming management plans and protects your growing investment. In doing so, we help you increase your property value by 15%. Complete Tree Trimming/Pruning - The tree is thinned by removing conflicting branches, which increases light penetration and air flow. The tips of each branch are lightened to prevent breakage and failure. Excessively long branches are trimmed back to be consistent with the species' natural shape. Dead and diseased limbs that are ½ inch in diameter and larger are removed. Lower limbs are trimmed or removed as necessary to be raised over turf, structures or streets. This type of trimming is ideal for medium-sized, mature trees that are important to the overall landscape. Tree Maintenance Trimming and Pruning - Similar to the complete pruning and trimming package, this method involves thinning the tree to remove conflicting limbs, which increases light penetration and air flow. Branch tips are thinned to prevent breakage and failure, while excessively long branches are pruned back to be consistent with the species' natural shape. Dead and diseased branches that are 1 inch in diameter and larger are removed. Lower limbs are trimmed and removed as necessary to be raised over turf, structures and streets. This type of pruning is ideal for clients with a smaller tree care budget, such as a rental property. Fine Trimming and Tree Pruning - Ideal for ornamental trees, this style includes thinning the tree to remove conflicting branches. Dead limbs that are ¼ - ½ inches in diameter and larger are removed. The tree is lightly shaped to its natural form. Structure Pruning for Saplings and Young Trees - Younger trees are trimmed to establish a main central leader and strong scaffold branches. To accomplish this, limbs with weak branch unions are removed or pruned to increase strength. Dead limbs that are ½ inch in diameter and larger are removed. Lower limbs are trimmed or removed as necessary to be raised over turf, structures and streets. Tree Trimming and Pruning Safety Services - Dead and broken branches that are 2 inches and larger are removed. This method is ideal for trees involving a safety issue but not a large budget. Tree Crown Reduction Trim/Prune - This type of pruning reduces the height and/or spread of the tree and is appropriate for those that are outgrowing their space or have sight/distance issues. Fruit Tree Pruning - A highly specialized type of pruning that yields better fruit crops and higher quality fruit. Our Certified Arborists help your apple, peach, plum, cherry and pear trees stay healthy, safe and produce the best possible fruit with regular pruning services.